When you come to Mojave Auto Group, you can check out the all new subcompact SUV that is the Nissan Kicks. We feel that you will be pleased with the technology that is packed into this vehicle. 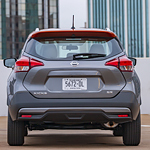 Connecting your phone to your vehicle might be important to you, and the Nissan Kicks makes it easy for you to do that. Whether you have an Android phone or an Apple one, you will be able to get that phone set up with your vehicle so that you can control it easily and use it with the vehicle's sound system. When you head out of town and you need to have a way of charging all of your devices while on the go, you will be happy for the USB ports that are part of the Nissan Kicks. This vehicle gives you three USB ports that you can use for your own devices and the devices of your traveling companions.